Tramlines festival have added yet more exciting names to the bill, including The Dandy Warhols, Public Service Broadcasting and Kate Jackson. And there’s a fresh crop of artists joining their DJ programme, from Cut Chemist and Steve Davis of snooker fame to Tom Findlay from Groove Armada and Zero 7. It’s a cracking lineup this year, so we thought we’d celebrate with our selection of unmissable acts and a competition to win a pair of tickets! Listen and read on for details. Dizzee Rascal has been playing genre-defining debut album Boy in da Corner in full at recent gigs and although there’s no suggestion that he plans to do the same at Tramlines, it’s probably not too much of a stretch to suggest his set will be heavier on the old stuff. Not that it matters with a back catalogue full of pop smashers anyway. Blood Sport take elements of afrobeat and bolt them to noise rock to create a baffling, shapeshifting, droning but always danceable whole. They’re hypnotic, relentless, heavy. To be honest, it’s a fool’s errand trying to describe them, and yet here we are. They’re brilliant! If it’s grinning indie pop you’re after, Cowtown are the good time party band for you. They don’t so much write songs as pile hooks onto hooks with a breathless energy. Having played endless house parties they’re more than aware of the importance of not wasting a second. Make sure your dancing shoes are tied on tight. Kate Jackson makes her triumphant return to her former hometown of Sheffield proudly showcasing her brand new album British Road Movies. There’s a definite progression into more synthesised textures on some tracks and appropriately cinematic strings on others. Whatever happens this is sure to be a celebration. Synth-pop wonder Gwenno might be singing mostly in Welsh but you can rest assured it’s about important stuff like smashing the patriarchy, the perils of capitalism, and robots taking over the world. It’s all a thousand miles away from her previous band The Pipettes, more krautrock than kitsch. Public Service Broadcasting’s most recent album veered from pulsating electronica to insanely catchy funk anthems via proggy meditations on the moon landing, and that’s all without digging deeper than the singles. Live they manage to juggle their samples of old public information films, archive footage and propaganda with, you know, playing a gig. Kelis isn’t exactly prolific as far as playing live goes, but her Dave Sitek-produced most recent album Food’s jazzier textures seep into her older material, giving them a more laid back, lounge feel. If that sounds odd, it works really well. It’s sure to be a treat. While the idea of watching live acid house might not appeal to everyone, Paranoid London’s brand of classic Chicago acid house, stripped back stark beats, massive basslines and ear melting 303’s, is a must see. However, thanks to their use of analogue equipment there is a warming, almost comforting vibe to it, like when you haven’t seen a friend for a long time and you pick up where you left of. Oh and their sets are incendiary too! After witnessing Meilyr Jones woo audiences at his recent Manchester gig, we can’t wait to see his flamboyant sermon in the holy grounds of Sheffield cathedral. His brassy, classically influenced pop combined with his Jarvis Cocker stylings mean that this is certain to be a highlight of the weekend. To enter our competition to win a pair of tickets all you have to do is follow us on Twitter or like us on Facebook. Then, retweet the competition tweets or share our Facebook competition posts. If you have already followed or liked, simply retweet or share and you will be in with a chance. The competition closes at midday on Friday, 10th June 2016. The winner will be picked at random and notified via Facebook or Twitter within 24 hours of the competition closure date. Competition Terms and conditions can be found here. 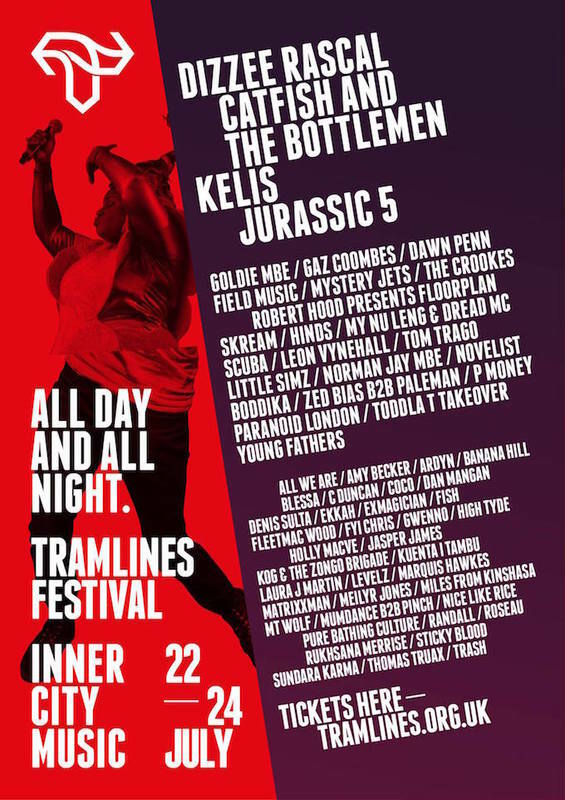 Tramlines will run from 22nd – 24th July 2016. Ticket and full line up information can be found here.